Q. When will macOS Server 5.4 be available? A. macOS Server 5.4 was released on the 25th September 2017 - it was replaced with macOS Server 5.7.1 on the 28th September 2018. However, you can still purchase/download it from the Mac App Store. Q. How much does macOS Server 5.4-5.6.3 cost? Q. What's the difference between Server 5.6.3 and earlier versions? A. macOS Server 5.4.x/5.5.x includes multiple services. A. macOS Server 5.6.x includes multiple services - you get all the services but some of them may be hidden in the Server administration application (you can unhide them). Q. Apple has said many services are being hidden/removed from Spring 2018. How does this affect macOS Server and what I can do with it? Q. How can I buy/obtain macOS Server 5.4-5.6.3? Q. 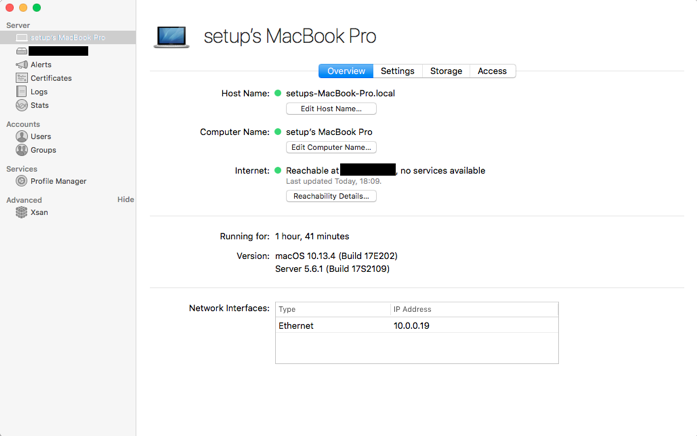 What Macs can I install macOS Server 5.4-5.6.3 on? A. macOS Server 5.4-5.6.3 requires a Mac that can run macOS 10.13 High Sierra. Q. I have a powerful Mac Pro / Xserve or a Mac with an early "Core 2 Duo" which is a good Intel processor. Why can't I run macOS Server 5.4-5.6.3? A. macOS Server 5.4-5.6.3 requires a Mac with macOS 10.13 High Sierra installed on it so you can only run macOS Server 5.4-5.6.3 on a Mac that supports macOS 10.13 High Sierra. Q. If there is no physical macOS or Server discs and I install macOS + macOS Server 5.4-5.6.3 but run into trouble what can I do? When macOS High Sierra + macOS Server 5.4-5.6.3 is installed it creates a special bootable emergency "recovery" area on your hard disk. You can Use the macOS "Recovery HD" to repair your hard disk and/or reinstall macOS + macOS Server 5.4-5.6.3 (internet connection required). If you have created an emergency external USB recovery drive using Apple's Recovery Disk Assistant you can use it to boot your computer from and repair your hard disk and/or reinstall macOS + macOS Server 5.4-5.6.3 (internet connection required). If you have a Time Machine backup disk it may have an macOS "Recovery HD" partition on it which you can use to repair your hard disk and/or reinstall macOS + macOS Server 5.4-5.6.3 (internet connection required). Q. What should I do to prepare for macOS Server 5.4-5.6.3?